Not every woman wants to attend a women’s conference, tea, or Bible study. Sometimes it’s because she’s not interested. Sometimes she doesn’t see it as a priority. Oftentimes, she doesn’t know she’s welcome. Putting an event in the church bulletin doesn’t ensure everyone feels welcome. I recently had a conversation with a woman who posed this question: “Why do you think younger women today don’t get more involved?” I shared a few thoughts, mainly focused on the communication breakdown between women who are planning ministry and those who are uninvolved. I suggested the issue is two-way: those in leadership aren’t effectively communicating what’s available, what needs may be met, and who is welcome. This makes it difficult for those who are disengaged to have opportunities or feel comfortable sharing ideas, needs, and thoughts. “It comes down to what I’m willing to invest,” I concluded. “Is my focus simply on putting together a program and expecting people to come? Or is my focus on getting to know women and their needs and passions and meeting the needs and feeding the passions?” I explained how the best way to get women involved is through personal relationships and invitations. Women are more likely to attend an event or study with a friend. We also need to invite multiple times in multiple ways. God created us for relationships. He wants us to intentionally invest in each other’s lives as He guides. Programs can be effective, but aren’t magically magnetic. In order to engage women, we must put people over tasks. We must set our own expectations aside to respond to what God wants us to do. While an event reaching hundreds can be inspiring, intentional time spent with one woman can create a quiet yet far-reaching ripple effect. When you’re willing to make the effort, try these ideas. 1. Cook together. Swapping recipes is great, but cooking together is a lot more fun. Grocery shop together. Share tips while in the kitchen. Enjoy the meal together or make enough to take home to both families. Even clean-up will be more fun together! 2. Make a standing date. Weeks and months easily slip by with the best of intentions to get together. Set a biweekly or monthly date. Swap planning responsibilities for variety or grab coffee and a snack at the same restaurant every time. You’ll soon anticipate your regular time together. 3. Give mom a break. Offer to hang out with a young mom on a regular basis so she can get things done around the house while you occupy the children. Your willingness to spend time investing in her children will pour encouragement into her. 4. Serve together. Find a way you can help someone you both know or serve a community agency. Clean at a local crisis pregnancy center, or bake and deliver cookies to people in assisted-living. 5. Work out together. Try a new exercise class together or hold each other accountable by expecting to see each other at a weekly class. Meet at the local gym for regular workouts or enjoy early morning strolls together. 6. Swap support. Ask for and offer help. Find out what projects others are involved in and lend your support. Ask for help so others are comfortable asking you, too. As you support each other, you share the weight of responsibilities while also getting to know each other. 7. Gather a group together. Get together with additional people so you avoid isolating yourselves. Whether you attend an event or study with other women or host friends for coffee and dessert, get to know each other as you interact with others. 8. Organize photos together. Encourage each other to catch up on printing and organizing photos. As you categorize them into years, family members, or projects, you’ll get closer to each other as you share memories. 9. Learn from each other. No question is insignificant. If you want to know how to create an event or share someone’s photos on Facebook, just ask. If you want to gather ideas for closet organization or landscaping, just ask. If neither of you knows the answer, search for it together. 10. Remind each other. Serve as sticky notes for each other, extending accountability by following up when someone shares plans for an apology, organization, service, and so on. As you touch base with each other on a regular basis, your friendship becomes part of your routine, and you’ll stick together through struggles and triumphs. Look around you today for opportunities to connect with others. A lasting friendship might begin with a smile or a heated discussion. Expect the unexpected. God doesn’t work within our guidelines. 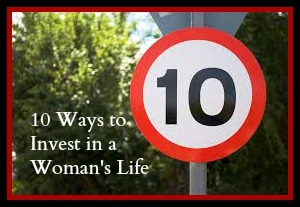 Let Him guide you to the women whose lives you need to invest in.